This post discusses the clay tablet that is known as Plimpton 322. This tablet gives us a glimpse of the powerful mathematics practiced in ancient Babylonia almost 4000 years ago. We aim to give a sense of why Plimpton 322 is fascinating. The math in the tablet informs us of the past as well as informing us of the present. We also work some trigonometry problems using Plimpton 322. The dimensions of the tablet are 8.8 cm by 12.7 cm (3.5 inches by 5 inches), about the size of a small pocket calculator. It was purchased by the New York publisher George Arthur Plimpton in 1923 from Edgar J. Banks and was donated to Columbia University upon Plimpton’s death in 1936. Henceforth, the tablet had been known as Plimpton 322, signifying that it is the 322nd item in Plimpton’s collection. According to Edgar J. Banks, the tablet came from a location near the ancient city of Larsa (modern Tell Senkereh) in Southern Iraq. Eleanor Robson, an Oriental scholar at the University of Oxford, estimated that Plimpton 322 was created around 1800 BC in Babylonia, more specifically about six decades before Larsa fell to Hammurabi of Babylon in 1762 BC. Thus Plimpton 322 dated back to the Old Babylonian period in Mesopotamia about 4,000 years ago. What is in Plimpton 322? The Plimpton 322 was written in cuneiform script. The numbers contained in the tablet are sexagesimal numbers (base 60). It was at first assumed to be just another Babylonian ledgerbook. In the 1940s, Otto Neugebauer, a historian of ancient science at Brown University, and his assistant Abraham Sachs found that Plimpton 322 actually contains interesting mathematical contents. The entries in the tablet are essentially Pythagorean triples, i.e. the integer solutions to the equation . In order to appreciate Plimpton 322, let’s look at how the contents of the tablet are structured. The front side of Plimpton 322 has 15 lines of numbers displayed in four columns. The line at the top above the numbers contains some labels. The rightmost column contains the row numbers (or line numbers) from 1 to 15. The middle two columns contain the short side and the hypotenuse of 15 right triangles. 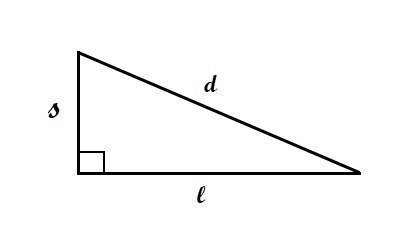 In other words, the second and third columns of Plimpton 322 are two sides a right triangle such as the one shown below. The third column of the tablet shows , the hypotenuse of a right triangle (or diagonal). The second column shows , the short side of a right triangle. The long side of a right triangle is not shown. The first column in Plimpton 322 is the square of a ratio, which can be one of two interpretations, either the square of (diagonal over long side) or the square of (short side over long side). The following diagram shows the descriptions of the four columns. What is Special about Plimpton 322? The discovery made by Otto Neugebauer and his assistant in the 1940s was an important one. The numbers in Plimpton 322 are what are now called Pythagorean triples. It gives the short side and the diagonal (hypotenuse) of 15 right triangles. The long sides of the right triangles are not shown. As we will see below, the 15 right triangles have steadily decreasing slopes. The Sumerians in the Old Babylonian period knew about the Pythagorean theorem over 1,000 years before the time of Pythagoras! Since the discovery made by Otto Neugebauer, Plimpton 322 was a subject of extensive research by mathematicians. 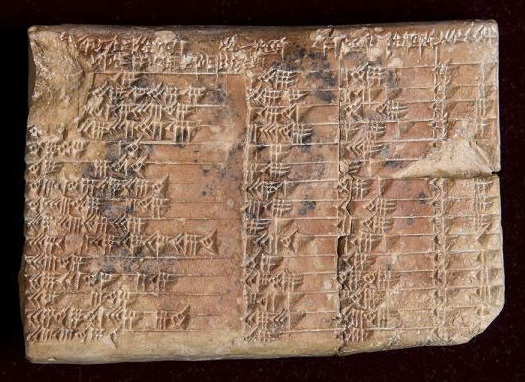 Obviously mathematicians are intrigued by the connection of a 4000-year tablet with modern mathematics. Because of the intricate mathematical interpretations they made of the tablet, many mathematicians thought highly of the tablet. For example, the author of the tablet must be a mathematical prodigy or a professional mathematician, doing high level research in the Old Babylonian Period. However, there are opposing views. Eleanor Robson does not view Plimpton 322 as the work of a math prodigy or professional mathematician. Her view of Plimpton 322 is more mundane. She believes that Plimpton 322 was created as teaching aid with a purpose of generating problems involving right triangles and reciprocal pairs. Links are provided below for research stating these different points of view. High level math research or merely teaching aid, the fact that the tablet contains Pythagorean triples is fascinating and interesting from a mathematical point of view. Let’s continue to examine the tablet. We give a small demonstration that it can be used for working trigonometry problems. The numbers in the tablet are sexagesimal numbers (base 60). To make things easy for us, the following table shows the decimal conversion of Plimpton 322, taken from the Wikipedia entry on Plimpton 322. The first column is either the square of the diagonal over the long side or the square of the short side over the long side. For example, the long side in Row 1 is 120. The square of 169/120 is 1.9834. The square of 119/120 is 0.9834. To help us work problems, we expand the table with three more columns. The three additional columns are the long side and the ratios of Short over Long and Diagonal over Long. The square of these two ratios would be the first column of the table. The 6th column (S/L) is the slope of the right triangle in Figure 1. So the 15 right triangles in the table have steadily decreasing slopes. The angle between the diagonal and the long side goes from 44.76 degrees (in Row 1) to 31.89 degrees (in Row 15). such that and are integers. The ingenuity is that the special right triangles obtained in this fashion can be used for solving trigonometric problems as demonstrated below. Solve for the unknown side for each of the following two right triangles A and B. Obviously the triangles are not drawn to scale. They are only meant to convey the problems. We show how to use Plimpton 322 to estimate and . In triangle A, we are given the diagonal and the long side. Immediately we can compute the ratio . This ratio is closest to the D/L ratio in Row 7 in Table 2. We use the right triangle in Row 7 as the reference triangle, i.e. the triangle in Row 7 and triangle A are (approximately) congruent. The ratios of the short side to the long side for both triangles should be approximately identical. Solving for gives 122.9285513. The modern approach would be to use the Pythagorean theorem with the help of a calculator in taking square root. Thus the exact answer is . Of course, this approach was not possible in the Old Babylonian period as the concept of square root was not known at the time. In triangle B, the short side and the long side are given. It follows that the square of the diagonal equals the square of the short side plus the square of the long side (this is known as the Pythagorean theorem to us but the relationship is also known to Babylonian users of Plimpton 322). Compute the following ratio. The above result is identical to the square of the ratio of the diagonal over the long side. Then compare this result to the first column of Table 2 (or Table 1). The closest is the number 1.489417 in Row 12. Then use the right triangle in Row 12 as the reference triangle. Thus the two triangles are approximately congruent. Solving for gives 96.4291667. The answer from a modern approach would be . Both answers using Plimpton 322 are quite close to the exact answers, even though the discrepancies are significant (0.148 for and 0.422 for ). However the problem solving using Plimpton 322 is indeed special. Essentially we are solving trigonometric problems without using trigonometry, i.e. using angles and sine and cosine functions. In the Old Babylonian period, there was no concept of angles and there certainly was no trigonometry as we know it today. Hipparchus (190-120 BC), a Greek astronomer, geographer, and mathematician, is considered to be the father of trigonometry. He lived 1,600 years after the creation of Plimpton 322! Note that the modern answer for is and for is . These two square roots are the results of applying the Pythagorean theorem. Plimpton 322 allows taking square root without using square root! Pythagoras (570-495 BC) lived more than a thousand years after the creation of Plimpton 322. So using a cheat sheet from 1800 BC, we can solve trigonometric problems without using methods that only came thousand or more years later. Recent research by Daniel Mansfield and N. J. Wildberger compared the methods of using Plimpton 322 to using the well-known sine table created by the Indian astronomer-mathematician Madhava (1340–1425 AD), over 3,000 years after Plimpton 322. Their problems are similar to the examples given here. The approach using Plimpton 322 produces much more accurate answers than the approach of using the sine table of Madhava. It is amazing that an 1800 BC “trigonometric” table beats a trigonometric table that came 3,000 later! 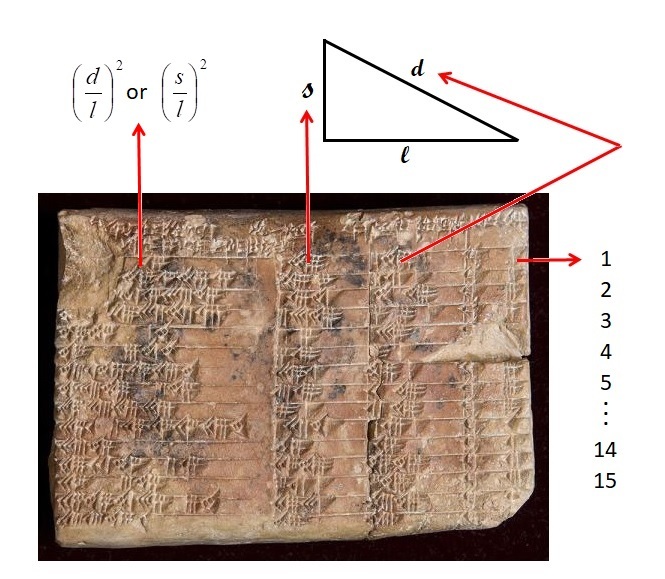 If the Babylonians were indeed using Plimpton 322 as a trigonometric table, then it preceded Hiapparchus’ table of chords by about 1,600 years. The accuracy of using Plimpton 322 is highly dependent on the given sides of the right triangles, i.e. the approach is accurate only if the squared ratios are close to the ratios in Plimpton 322. However, Mansfield and Wildberger showed that the usefulness of Plimpton 322 can be extended using interpolation (the ancient Babylonians were big on interpolation). The calculation demonstrated here is only scratching the surface. What we have shown is just a small demonstration of the mathematical specialness of Plimpton 322. The examples we work are in no way a suggestion that it is how the stone tablet was used in the Old Babylonian period. The math in Plimpton 322 is wonderful and exciting. There is actually quite a bit of controversy about the tablet. What purpose did the tablet serve at its time? There are divergent views just on this questions alone. According to Mansfield and Wildberger, Plimpton 322 not only replaces Hiapparchus’ table of chords as the world’s oldest trigonometric table, it is the world’s only completely accurate trigonometric table. For more information, see the article by Mansfield and Wildberger. Mansfield and Wildberger believe that Plimpton 322 would have been used in engineering calculations for the construction of palaces, canals or perhaps the Hanging Gardens of Babylon. According to Eleanor Robson, Plimpton 322 was merely a teaching aid for problems involving right triangles (article). According to Robson, ancient mathematical texts and artifacts such as Plimpton 322 must be viewed in light of their historical and cultural contexts (in addition to the mathematical). The mathematics contained in Plimpton 322 should not be examined in isolation. Though the modern mathematical interpretations of Plimpton 322 may have no relation to its original use, it is undeniable that the mathematics in Plimpton 322 is fascinating. It makes for good material for any math teacher’s lesson plans. It ought to be reassuring to students that the math topics that they deal with were also practiced by students 4,000 years ago. The proof is in the tablet called Plimpton 322. Reporting of Plimpton 322 is easily found on the Internet (examples: here and here). The wikipedia entry on Plimpton 322 is a good source of information, as is the entry on Edgar J. Banks.